I would like to draw your attention regarding your statement about Article 35A wherein you accused Hurriyat Conference of dividing people of J&K and having a habit of muddying the waters. You also said that they(the Hurriyat) have nothing to do with Article 35A. Do I need to remind you that if today there is this type of situation where the special status (Article 370, 35A) is under threat who is responsible for it? Is it Hurriyat? No, Mr. Omar Abdullah, it is your own party, the National Conference, which is responsible for the current situation. Let me also remind you that it was Maulvi Muhammad Yousuf Shah who selected Sheikh Abdullah as a leader and introduced him to the public. But, in 1939, Sheikh converted the Muslim Conference into the National Conference with the only aim to get merged with Congress for merely achieving political gains. Was not it a betrayal with the Muslim majority people of Kashmir? Was not amounting to playing with the blood of 13 July 1931 Martyrs? In 1947, Sheikh Abdullah also played an important role in acceding Kashmir to the rest of India. He (Sheikh) has himself mentioned it in his biography ‘Aatash-e-Chinar that Mahatma Gandhi was not ready to send Indian Army to Kashmir but he (Sheikh) convinced him to do so to safeguard the secularism of India. This, in the end, proved disastrous not only for people of Kashmir but for the people of both India and Pakistan. Both the countries have fought three wars with each other just because of this issue. Since 1947 to till date, who is responsible for diluting all special provisions, articles granted at the time of accession, and be hand in glove with Congress for only achieving the power. Was that Hurriyat? Who is responsible for the hanging of Maqbool Bhat and Afzal Guru? Was that Hurriyat? Be it the Indira-Sheikh Accord which only brought suffering and agonies to the people of Kashmir or be it Rajiv-Farooq Accord which only proved disastrous for the Kashmir, the National Conference was complicit. The stand of your party changes according to the situation. Before the elections, your party seemed to be have taken one stand (Hurriyat Line) and after the elections, your party is in another mood. Now, if Hurriyat has alerted the people of Jammu and Kashmir about the drawbacks and perils of abrogation of Article 35A, what wrong have they done? Will it not have a direct impact on the demography of state? Is not it aimed at converting Muslim majority into the minority? From whom we expect it to fight our fight? 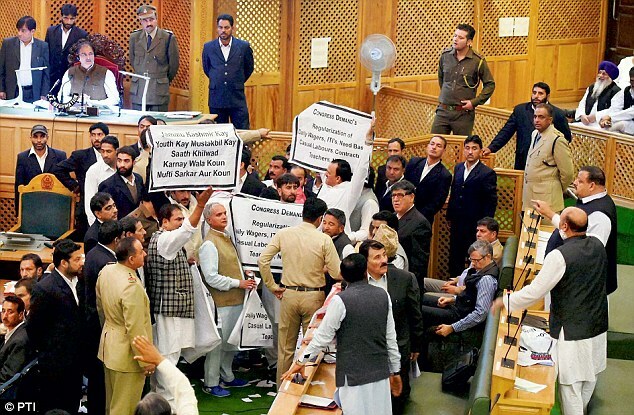 At a time, when common people of Kashmir are expecting from both mainstream as well as the pro-Freedom leadership to show a united approach against the possible abrogation of Article 35 A, you are engaging in a blame game which would lead us nowhere! You must give credit to AIP President Er. Rashid. Despite being in the mainstream camp, he has demonstrated character and political maturity by offering unity with Hurriyat on this special status issue; he is even ready to get his party Awami Itehad Party (AIP) merged with the Hurriyat with the intention to protect this special status. This level of political maturity is clearly lacking in you and your party. He also appealed to you in his latest press conference that it is not the time to indulge in blame games but unfortunately you seem to be having other ideas. I am neither expecting this from you nor I am advising you to offer unity with Hurriyat or jointly built a consensus with the only aim and intention to protect the special status of J&K. (I know it is not in your hands) Mr. Omar Abdullah, can’t you stand up, take a stand and stop politicizing this important issue which is linked with future of Kashmir? There are a number of issues in which you can do your politics but not this one such issue. The people of Kashmir today are mature enough to differentiate between right and wrong. It is not the 1950’s when people were blindly following anyone. It is high time for you and your party to change its ambiguous stand and be united with others against any anti-Kashmir move. Then, no one from outside can neither defeat us nor achieve their evil agendas.